Harvest Moon01263 715779work01603 870304fax Self-cateringThis cosy property provides a stylish, warm and comfortable place to have a holiday. 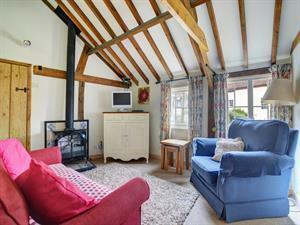 Full of charm it is close to beautiful countryside which offers many walks and cycle routes. Guests can also enjoy days out at the various beaches, which are only a short drive away. Additionally, there is a great selection of pubs and restaurants close by. Pretty courtyard with garden furniture, pots of geraniums and bright blue wooden fence. Harvest Moon offers weekly bookings starting on Saturday. This cosy property provides a stylish, warm and comfortable place to have a holiday. Full of charm it is close to beautiful countryside which offers many walks and cycle routes. Guests can also enjoy days out at the various beaches, which are only a short drive away. Additionally, there is a great selection of pubs and restaurants close by.